Astronaut Ice Cream was invented for NASA's Mercury Missions. Enjoy this delicious treat just like the astronauts. These freeze-dried Vanilla Ice Cream Sandwiches are real ice cream! 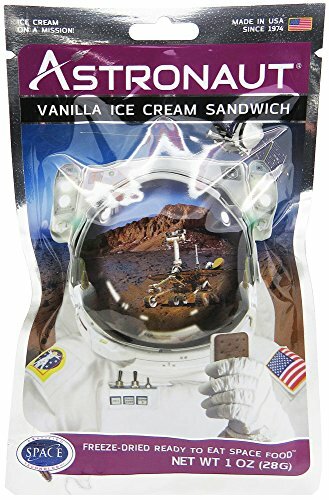 Astronaut Foods takes the ice cream you know and love, and with the power of freeze-drying create a yummy new snack. Frozen in time, yet not frozen in temperature. When you remove the water from the ice cream, what do you have? A delicious, crunchy, yet creamy sweetness that melts in your mouth, sandwiched between two chocolatey wafer cookies. If you have any questions about this product by Astronaut Foods, contact us by completing and submitting the form below. If you are looking for a specif part number, please include it with your message.